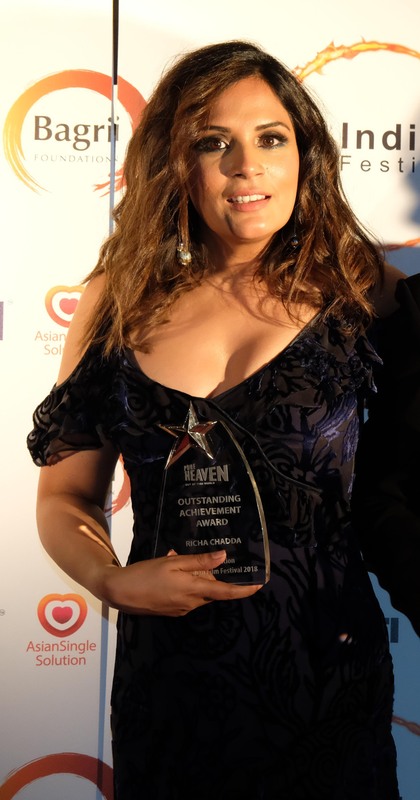 Pics: Richa Chadha locks the Outstanding Achievement Award at the London Indian Film Festival! Richa Chadha is truly one of the actresses of the current times who’s truly proved her worth time and again. Each of her performances have etched a truly lasting impression earning her a repute of being a powerhouse of talent. The actress who will soon be seen in David Womark’s production Love Sonia directed by Tabrez Noorani is currently in London where she’s in attendance of the ongoing London Indian Film Festival which opened the festival last evening. The film stars Richa as one of the leads alongside incredible actors like Rajkummar Rao, Manoj Bajpayee, Anupam Kher, Sai Tamhankar and others. The film opened to packed audiences at the famous Leicester Square in London last evening and got a thunderous response from those present at its world premiere. Not just that, Richa even walked away with the prestigious Outstanding Achievement Award. The actress was lauded for her role in Love Sonia and of her achievement as an actress and the incredible performances she’s delivered so far. Now this truly makes us excited to see the actress’ performance in the upcoming film which will soon have its India release. Speaking about the honour, Richa said, “This was completely unexpected. I was overwhelmed with the response to the film and very happy that people knew, appreciated my work here in London. People who are big fans of the fukrey franchise as well as Masaan. It was a humbling experience”. Apart from this the actress upon her return from London will begin shooting for the much awaited biopic of Shakeela and will then work on the season 2 of Amazon Prime’s Original Series – Inside Edge. Yami Gautam is now the brand ambassador of a Footwear brand!